Bohdan O. Szuprowicz developed speculative fiction about the disappearance of Flight 370. It may have been shot down by air force night fighters when a plan to crash into the Twin Towers of Kuala Lumpur was discovered. The question is who did it. SARASOTA, Fla. - May 15, 2014 - PRLog -- This is a fictitious speculation or speculative fiction developed by a visionary author with a very vivid imagination. He is not constrained by professional, political, emotional, religious, moral, and traditional training or practices. On every count, as the saying goes, he thinks and writes “outside of the box”. The basic concept for this E-Book is to provide a screenplay synopsis of locations, circumstances and events present at the time of disappearance of Flight 370. The author suggests several possible outcomes all based on the idea that the Flight 370 was hijacked for the purpose of crashing into the Twin Towers of Kuala Lumpur and make it look as if it was revenge for the destruction of World Trade Center in New York on 9/11. 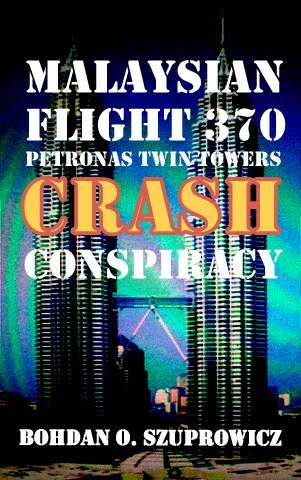 "Malaysian Flight 370 Petronas Twin Towers Crash Conspiracy"
The author happens to be an aeronautical engineer and even worked at Boeing at one time. This was about half a century ago when the chief pilot of the company rolled a Boeing 707 prototype during a test flight. He tried to check the integrity of engine attachments to the wings of the plane and he “heard about it” when he landed. Bohdan O. Szuprowicz monitored Flight 370 disappearance since March 8. Based on information during the last few months he came to the conclusion that the plane was taken over by a terrorist conspiracy that planned to turn it around and crash into the second tallest office towers in the world, the Petronas Twin Towers in Kuala Lumpur. Reported paths of the plane south or north in the Indian Ocean also appear to be a diversionary tactic. If it continued flying directly to the west it could reach Diego Garcia island, a major UK and USA military base which is not even mentioned in any reports. The disappearance of Flight 370 initiated numerous explanations based on insufficient or misleading information. Psychics, remote visionaries, alien abductees and shamans, try to predict the location of the Flight 370 final resting place. Some believe that hijackers may have taken the plane to places like Somalia, Pakistan, Iran, Kazachstan or even North Korea and plan to convert it into a nuclear weapons missile to attack Tel-Aviv, Washington or New York. This does not appear like a likely solution even if terrorists acquire or develop nuclear weapons. There are many alternative delivery systems of such weapons more convenient and easier to implement than a large Boeing 777 airliner. Many drones or ships and submarine devices would be much more practical. The author performs continuous research on Nuclear Terror Geopolitics and already published several fiction and non fiction E-Books on the subject. Bohdan O. Szuprowicz, President of 21st Century Research, arrived in the Unites States soon after the Russians launched the Sputnik satellite in 1957. He was recruited by Boeing in Seattle as an engineer and later he joined General Dynamics and IBM, whence he moved to the Center for Economic and Industrial Research Inc. headquartered in Washington DC. He began writing articles about progress of automation in many industries and became the editor of High Technology West, a subsidiary of the newspaper California Business in Los Angeles. This was followed by a round-the-world trip to evaluate computerization in many countries of Africa, Australasia and Europe and included a special visit to Vietnam to observe use of information technology under wartime conditions. He founded the 21st Century Research consultancy in 1974 and collaborated with Chase Manhattan Bank in setting up a market research operation to evaluate opportunities in China, the Soviet Union and Eastern Europe. He traveled frequently to those areas and crossed Checkpoint Charlie to East Berlin on several occasions. He also toured South Africa to observe apartheid environments and met with independence fighters in Namibia. His work on network planning earned him an invitation to present it at the International Symposium on Operations Research for Developing Countries in Paris. As a result of his experiences and research into global geopolitics, he published “Doing Business with People’s Republic of China” and “How to Avoid Strategic Materials Shortages” with John Wiley & Sons, as well as “How to Invest in Strategic Metals” with St. Martin’s Press. He also published “Multimedia Networking” with McGraw-Hill, which included Japanese and Korean editions and “Multimedia Tools for Managers” developed for AMACOM. Szuprowicz also collaborated for several years with Computer Technology Research, and published 15 corporate reports about search engines, multimedia, Internet marketing, and various networking technologies. He also published hundreds of articles in many countries in journals such as Les Affaires, Atlanta Constitution, Australian Financial News, Barron’s Weekly, Bull & Bear, Business South Africa, California Business, Canadian Business, China Business Review, Christian Science Monitor, Computerworld, Denver Post, Dun’s Review, Eurofinance, Financial Post, Investment Dealers Digest, IPO Reporter, Japan Economic Journal, National Investment & Finance of India, Newsday, Newsweek International, New Scientist, Oficinas, Polish Daily, Singapore Times, Skrzydlata Polska, Usine Nouvelle, Wall Street Microinvestor, Wall Street Transcript, ZeroUno and many others. Szuprowicz is an active member of the British Schools and Universities Club, the Schiehallion Club of Kinloch Rannoch, Republican Club of South Sarasota County, National Rifle Association, Sarasota Fiction Writers, Sarasota Authors Connection, Sarasota Writers Forum, Sarasota Camera Club, Sarasota PC Users Group, and was previously a member of the Royal Aeronautical Society.